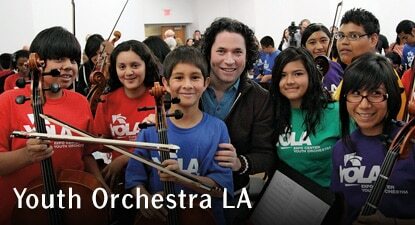 The Los Angeles Philharmonic Association, the USC Brain and Creativity Institute (BCI), and Heart of Los Angeles (HOLA), launched a five-year longitudinal research collaboration to investigate the impact of music training on children’s well-being and development in 2012. Now after only two years of music training (2013-15), the BCI has published preliminary results in a recentarticle in the notable brain science journal, Developmental Cognitive Neuroscience, that clearly demonstrates that these children already show marked progress in two vital areas: they are better at processing sound as shown by an enhanced ability to discriminate pitches i.e. being better at identifying changes in the auditory environment, and the maturation of their brain has accelerated, as suggested by specific EEG changes occurring during the processing of sound. These results add new insights and rigorous findings to the emerging discussion about the role of early music engagement in learning and brain function. These interim results strongly support the idea that music training during childhood, even for a period as brief as two years, does accelerate brain development and improves sound processing and can benefit language acquisition, speech perception, reading readiness and consequently the intellectual development of children. The results also demonstrate that community music programs, such as YOLA at HOLA, can offset some of the negative consequences that low socio-economic status has on child development, including improving the trajectory of language development of this group. The findings suggest another attractive possibility that the acceleration of intellectual and brain development that is currently observed will continue to have beneficial consequences on the children’s intellectual and emotional capacities well beyond the end of the intervention, providing a platform for further development in the future. Through a collaboration with the Youth Orchestra Los Angeles at Heart of Los Angeles (YOLA at HOLA) program, a partnership between the LA Phil and HOLA which provides free instruments and musical training to children from the Rampart District of Los Angeles, researchers at the USC Brain and Creativity Institute – directed by acclaimed neuroscientists Hanna Damasio and Antonio Damasio – are tracking how children respond to music from the very onset of their participation in systematic, high intensity music education. Starting with children between the ages of 6 and 7, the researchers use cutting-edge neural and psychological assessments and advanced brain imaging techniques to track brain, emotional and social development. The group of children involved in the YOLA at HOLA program is being compared to two control groups of children matched in age, socio-economic status and cognitive abilities – one involved in sports training but with no musical training and one group with no systematic training. All children are being followed for five consecutive years, providing a rare chance for researchers to discover the effects of musical training on emotional, social and cognitive aspects of development as they actually occur, rather than inferring later-life effects. Dr. Assal Habibi, a senior research associate at the Brain and Creativity Institute and a musician herself, USC University Professors Hanna Damasio and Antonio Damasio, directors of the Brain and Creativity Institute and the Dornsife Neuroimaging Institute at USC, and Dr. Beatriz Ilari of the USC Thornton School of Music, are conducting the study. Along with graduate students and research assistants, they work directly with YOLA children and their families, and collect data for the assessments. Research results and summaries of findings are being reported to the scientific community and are being made available to the public. This explains Mozart’s extraordinary technical capacities, like composing in his mind without sketching, and writing-out an opera while chatting with friends or during a billiard game. He was exposed to music from an early age onwards and toured around Europe under the strict instruction of his father, absorbing all types of music at any place.